Many interesting and unbelievable things happen in this world. Some of them are so astounding that some people managed to photograph them. 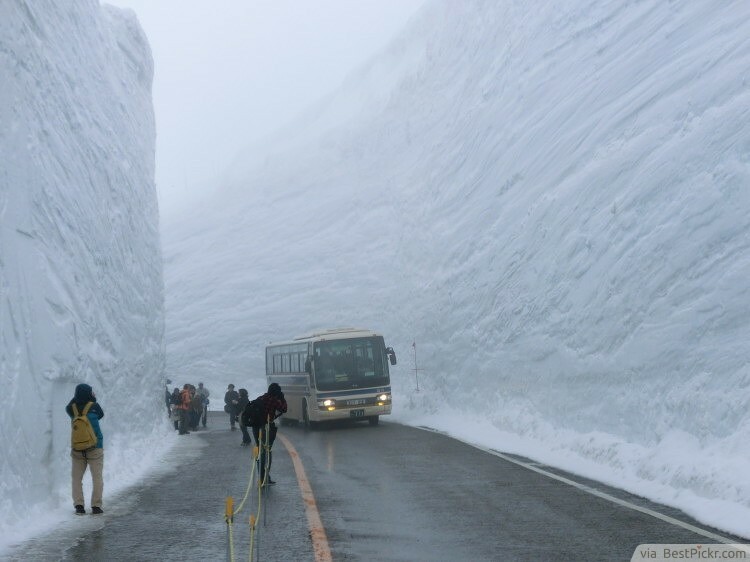 Here are 20 images that you won’t believe weren’t Photoshopped! No, this photo was not distorted! 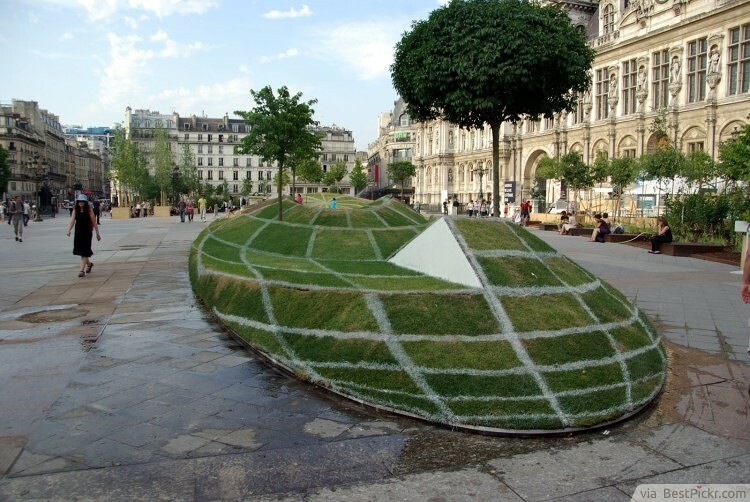 This piece of artwork is located in Paris, France. 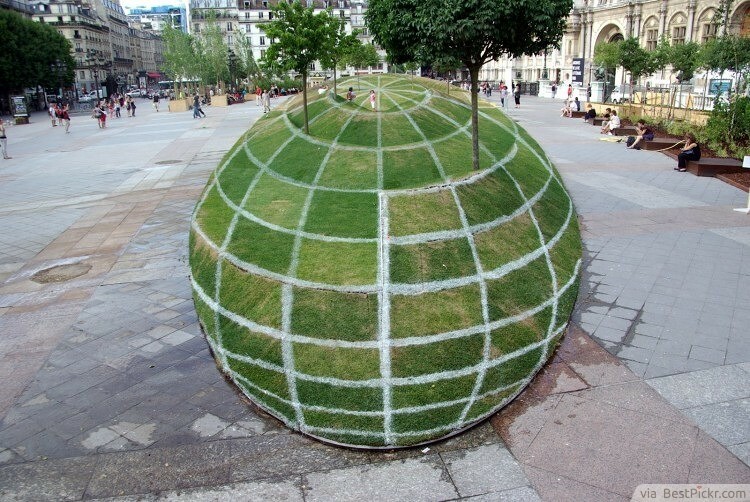 The grass isn’t in level at all, but in various formations thus creating a great illusion of a sphere. This looks like the car was rendered with vector graphics and inserted into the street photo. 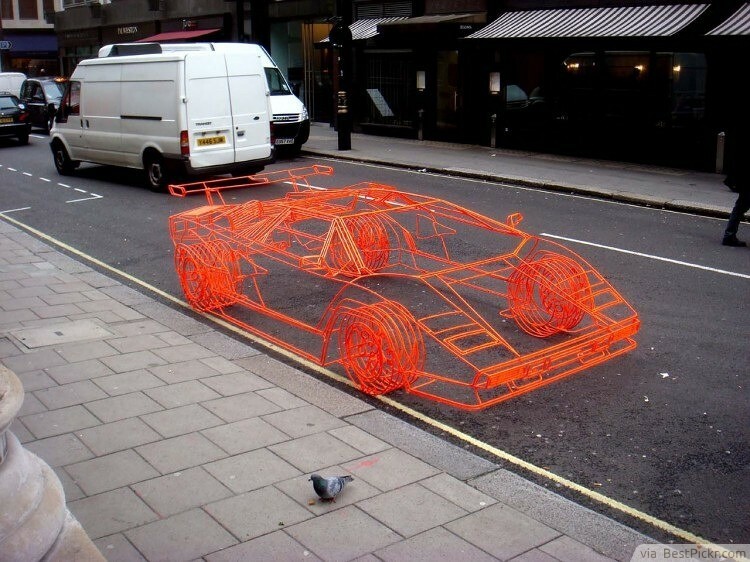 However, this car is actually a wire framed sculpture. This photo looks like someone clicked on one soldier and used the clone brush tool to drag and copy his image in the photo. 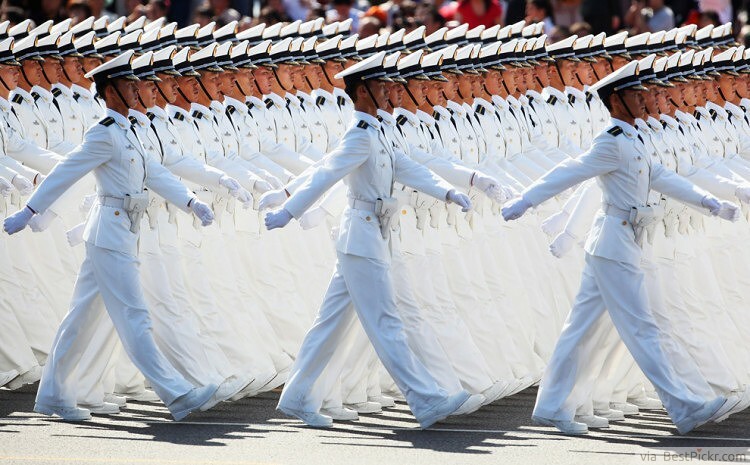 These soldiers are in a truly perfect formation! Even though it looks like good Photoshop, this actually happened. The Pasha Bulker ship actually ran into Australian land several years ago. The accident happened due to bad weather. This does look like a common Photoshop experiment gone bad. This is very real! 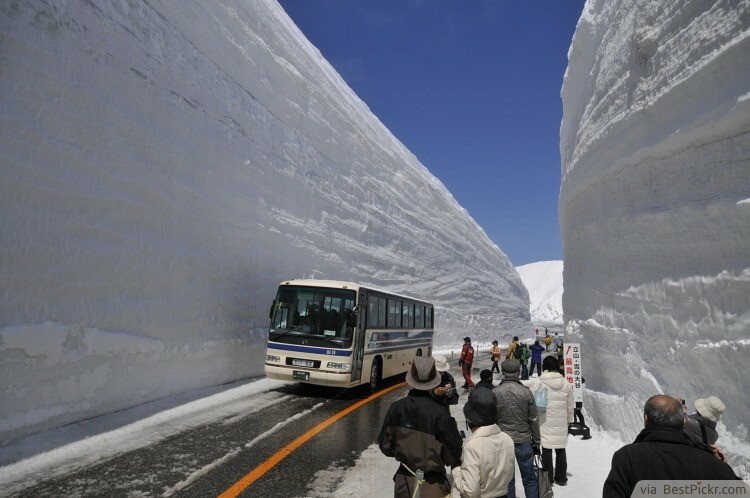 This happens in Japan. 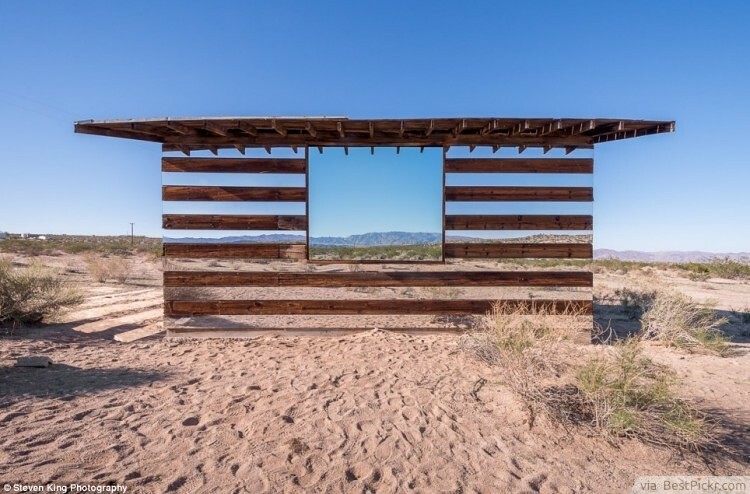 This looks like a pretty clever photo project, but the shack is in fact very real. 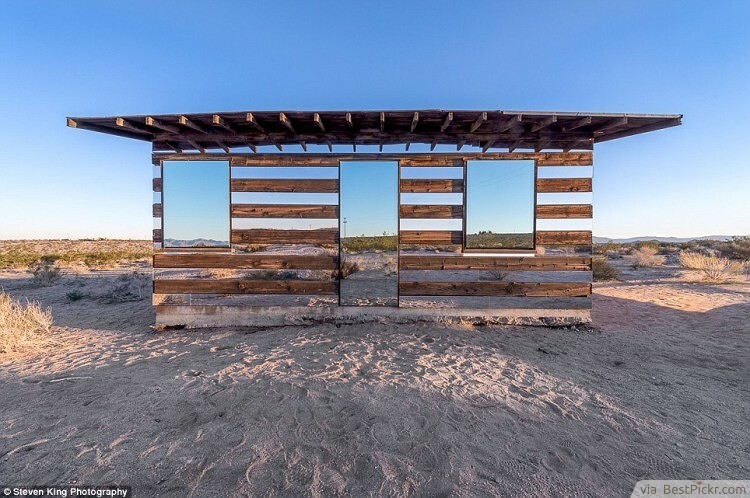 The mirrors were quite strategically placed on the shack, creating a very awesome illusion. 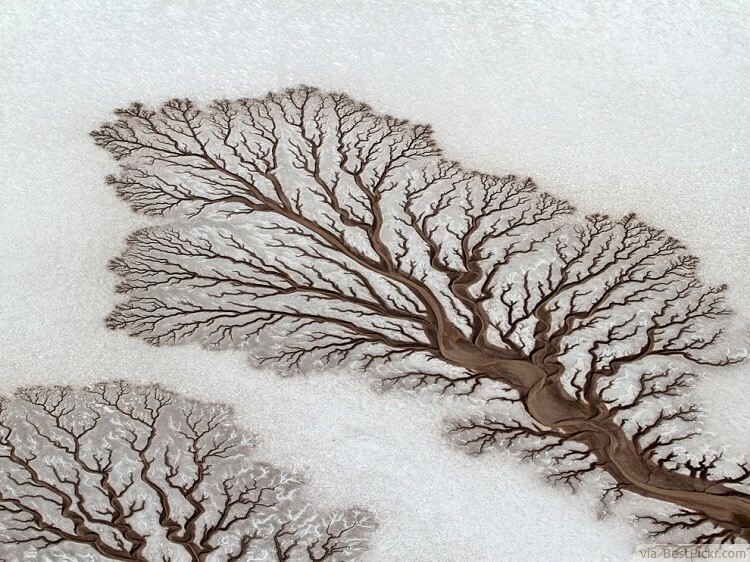 Even though this looks like a drawing, it’s actually a photo of a dried up river bed in Mexico. It is difficult to believe that this photo is real. This is not an altered image! 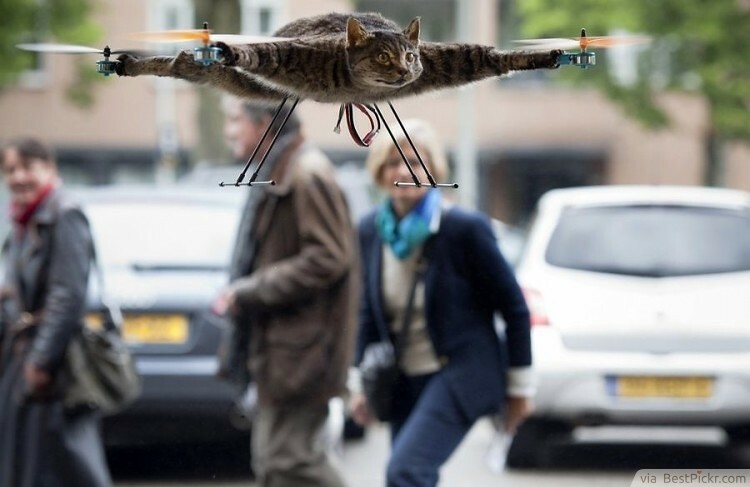 Even though it’s hard to believe, this person actually made a helicopter out of a cat! 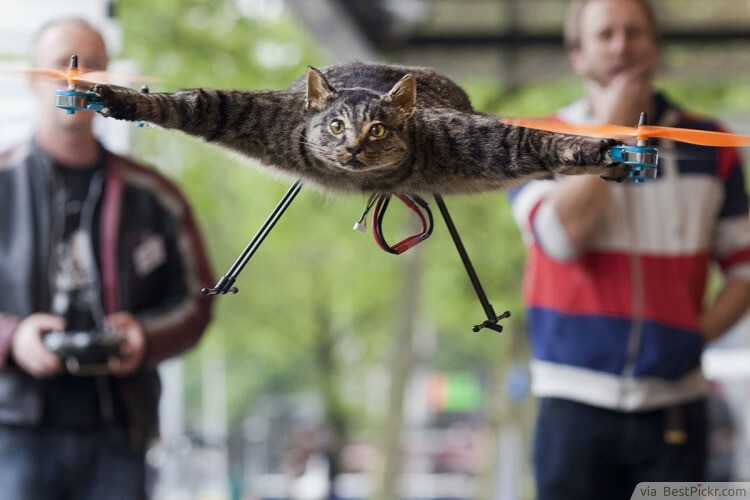 After his cat was killed by a car, artist Bart Jenson decided to turn his cat into a remote operated aircraft. 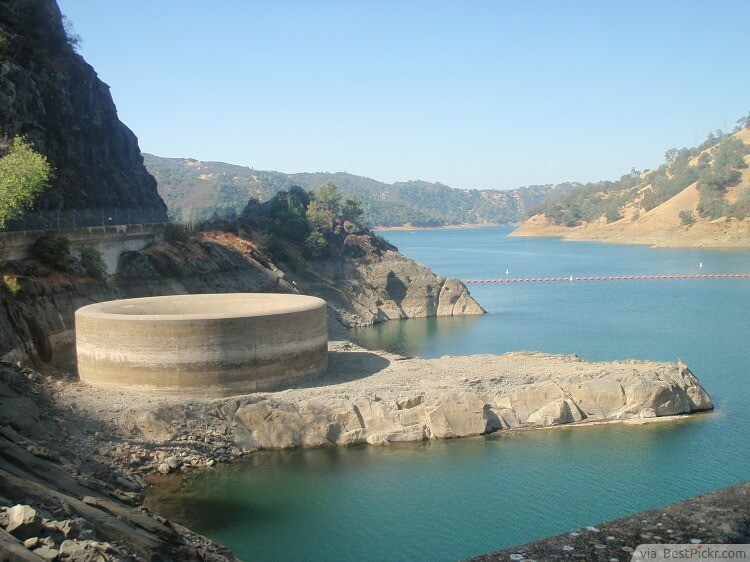 This is not a caption from a fantasy movie; it’s actually Lake Berryessa in Napa Valley, California. 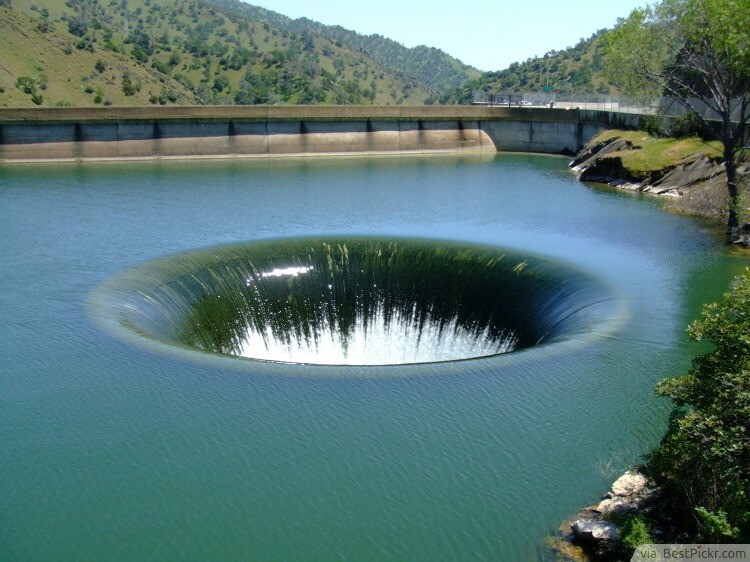 The drain controls the water levels in the lake. The drain is big enough to swallow your house. 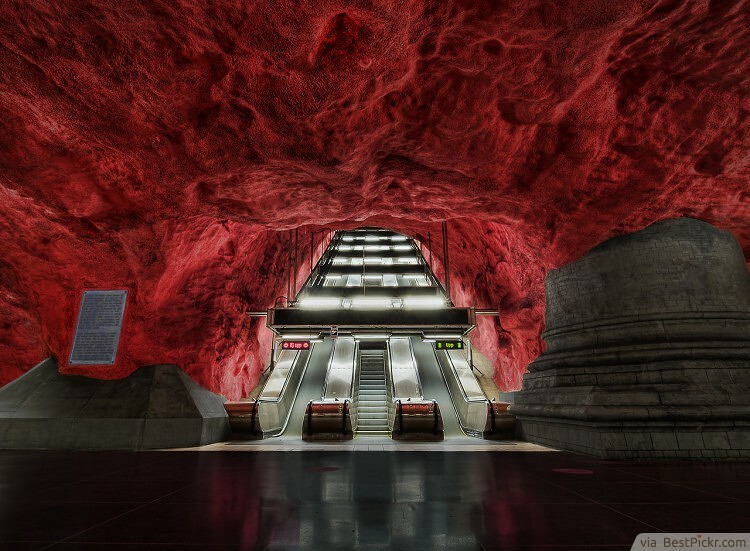 Even though it seems like a pretty good Photoshop illusion, this floor is actually real and pretty creepy. It’s a real shaft! 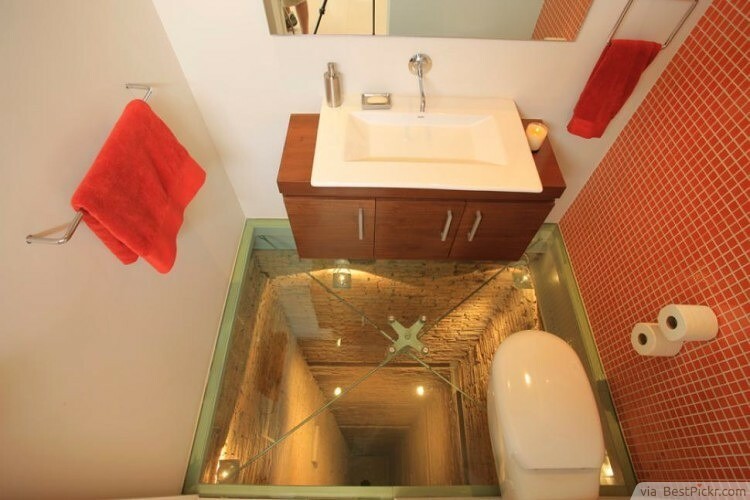 The person who designed the building thought it would be funny to put a bathroom on top of an elevator shaft. If one of the glass panes were ever to fail, you would plummet down the shaft to certain death. This is not Photoshop, it also actually happened! 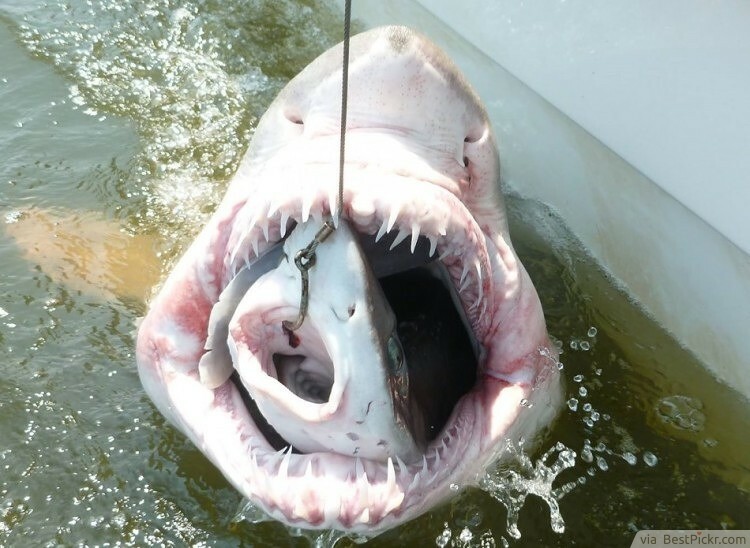 This shark was eating a dogfish when it got caught, and the dogfish was eating a goldfish! 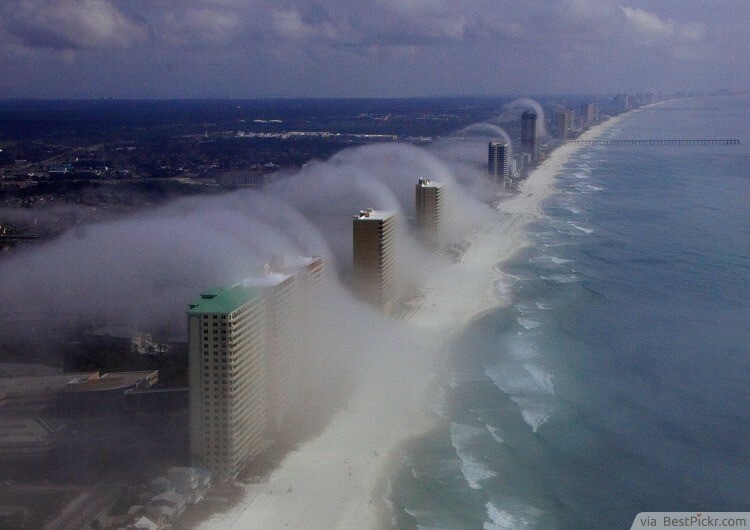 This water vapor tidal wave looks like a great photo effect, but it actually happened and it’s quite a low key natural disaster. 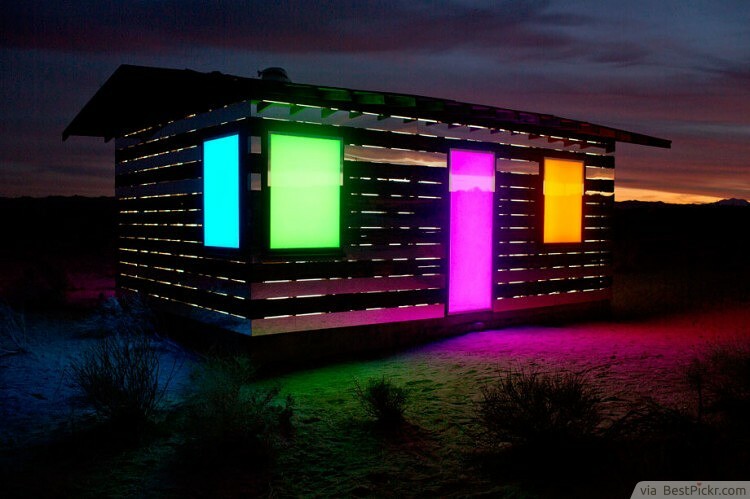 You can catch this site on rare occasions when the air is just the right temperature. This happened in Florida. This place is also very real. 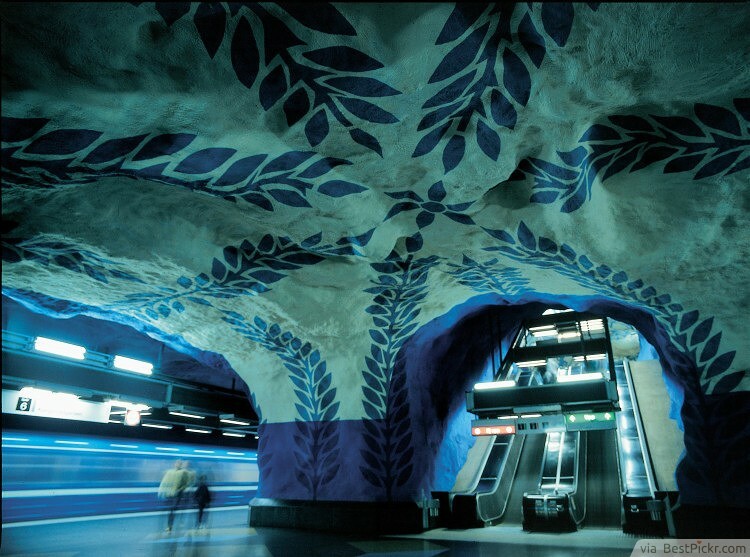 It’s one from one hundred decorated subway stations in Stockholm, Sweden. 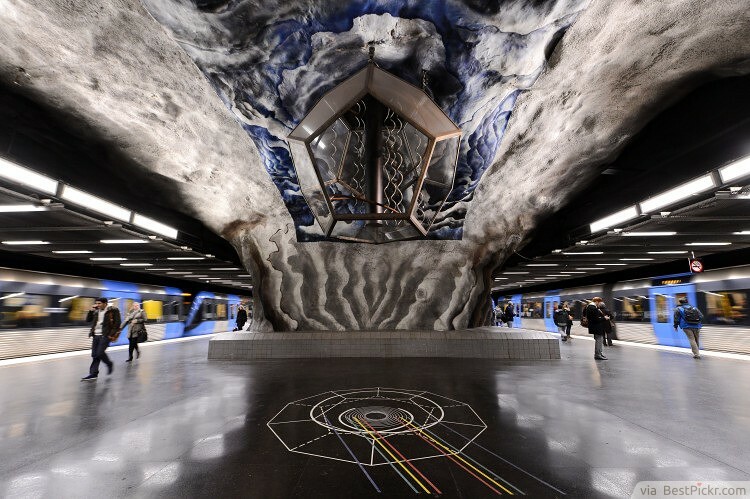 The natural rock ceilings have been painted and each station has its own design. 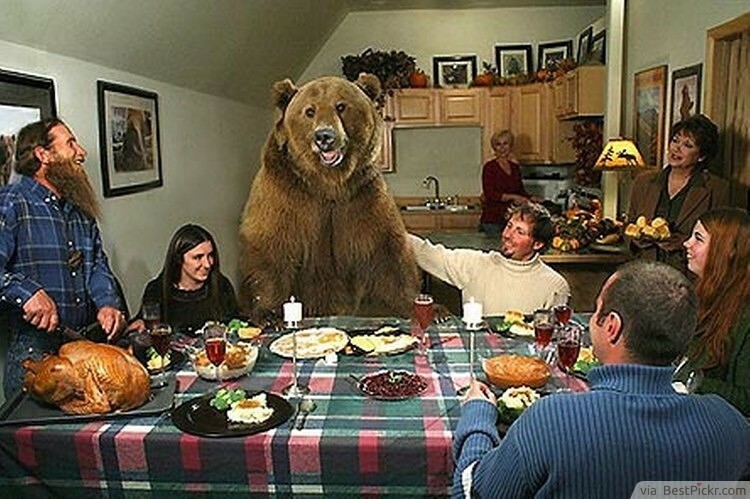 This is not a posed photo for a magazine; this is actually a photo of a family who is keeping this bear as a pet. There is an explanation which isn’t ridiculous that explains why this beach has star patterns across it. 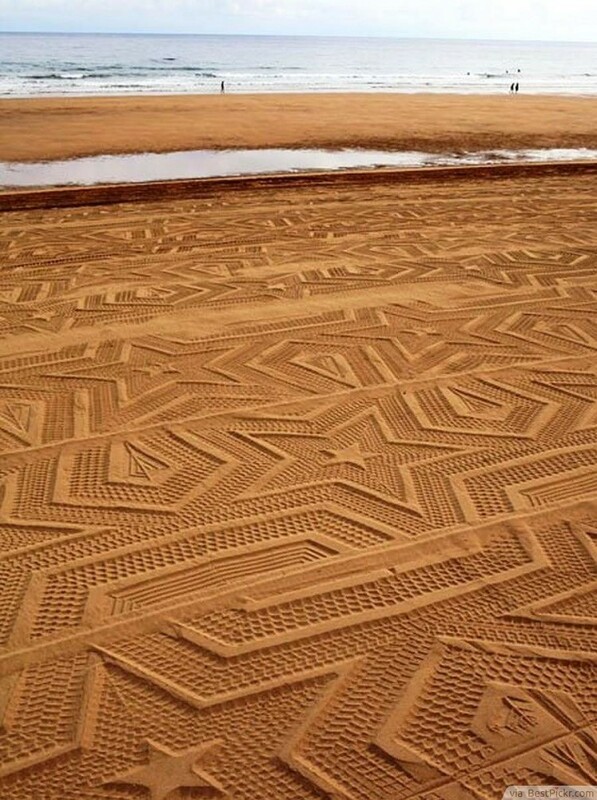 The patterns were made by a tractor. This is the work of a comic book genius! 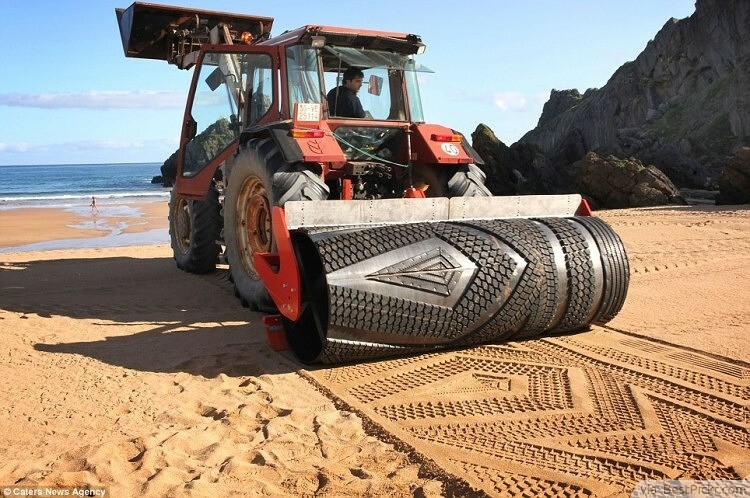 He built the sand pattern machine out of his old truck tires. 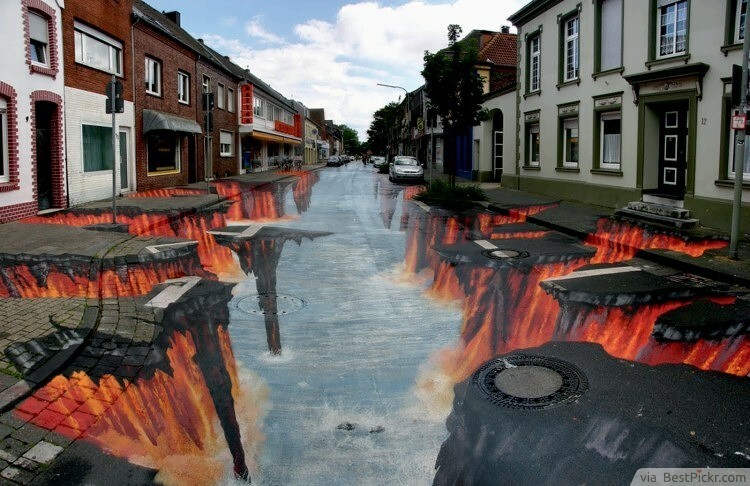 This is not an altered image, but rather a photo of a great piece of 3D street art that completely bends the mind. This looks like the kind of bad Photoshop that you can see across the internet all the time. 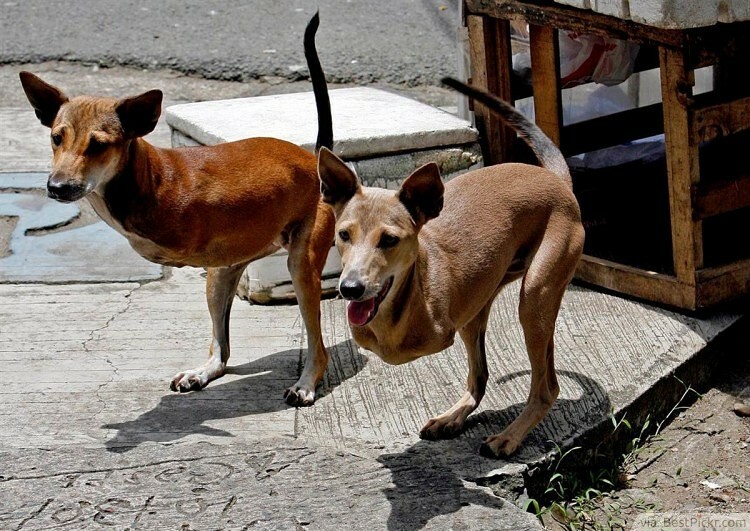 However, these dogs are actually real and they live in the Philippines. They were born without their front legs. This giant rubber duck was not Photoshopped. 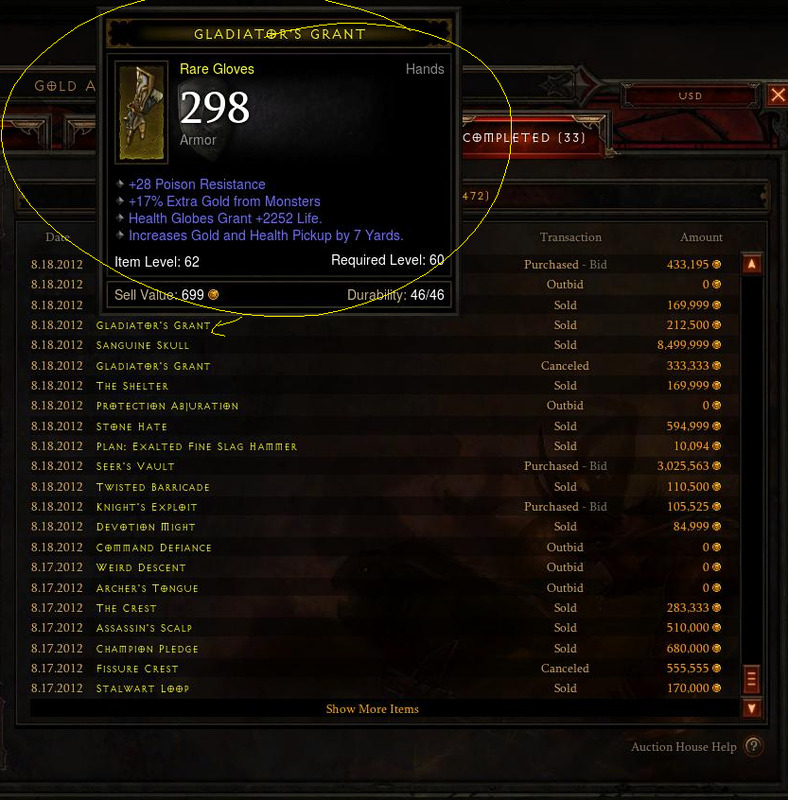 It actually exists! 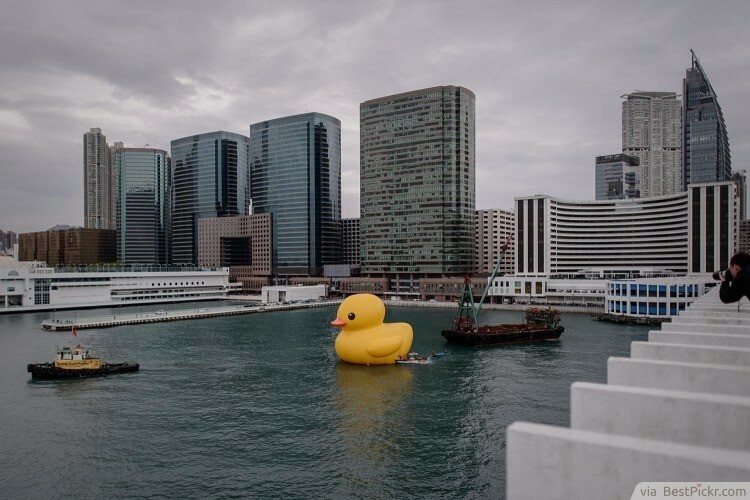 The artist made a 100 foot long rubber duck and planted it into the harbor with a crane. This looks like a badly faked UFO photo. 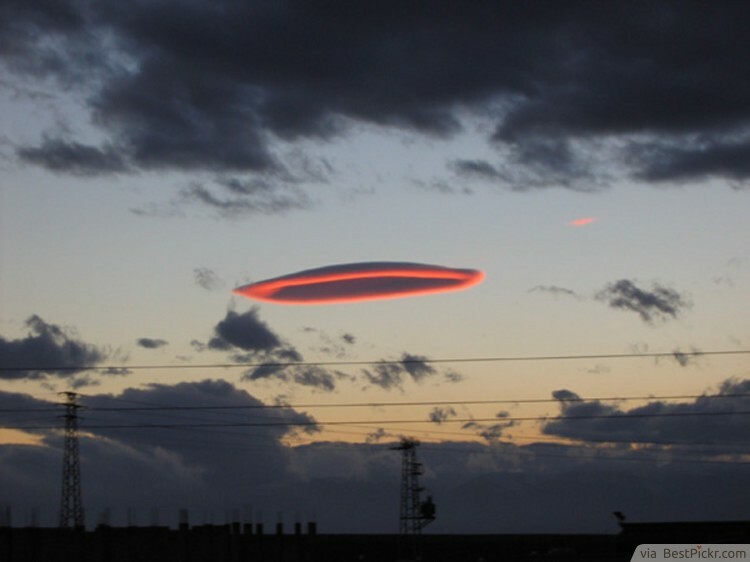 However, this is actually a cloud in a formation that occurs when the wind blows upwards into the cloud. At first glance, this looks like a Photoshop experiment gone really bad. However, this forest is very real. 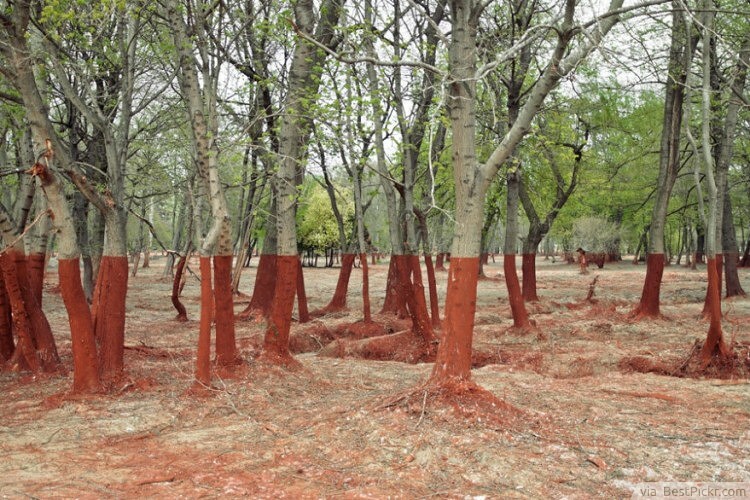 These are actually after effects of a horrible toxic spill in Hungary. The line is precise because the toxic sludge rose up to that point before it started decreasing.